Belarus is a key growing market in Eastern Europe and due to the country’s strategically geographical location between Western Europe and Eurasia, the Belarussian economy has experienced a huge increase in foreign investments over the last 10 years. The food industry is an important industrial sector in Belarus making the Food Industry in Minsk, taking place between 24th till 27th of March, a must see. The show is organised with the support the Ministry of Agriculture and Foodstuffs of the Republic of Belarus providing companies from around the world present the latest equipment and technologies in the food industry. Russell Finex, manufacturer of sieves and filters for food applications, will participate in the Food Industry in Minsk for the first time. Koen De Ridder, Sales Manager at Russell Finex N.V. comments : “We recognize the growing potential of Eastern European markets and take this opportunity to meet interesting business contacts by participating in the Food Industry”. At the show Russell Finex will present the Russell Eco Separator® a gyratory sifter which can accurately screen wet and dry food products up to five fractions. With this this food gyratory sifter you can improve the quality of your food products in a cost effective way. 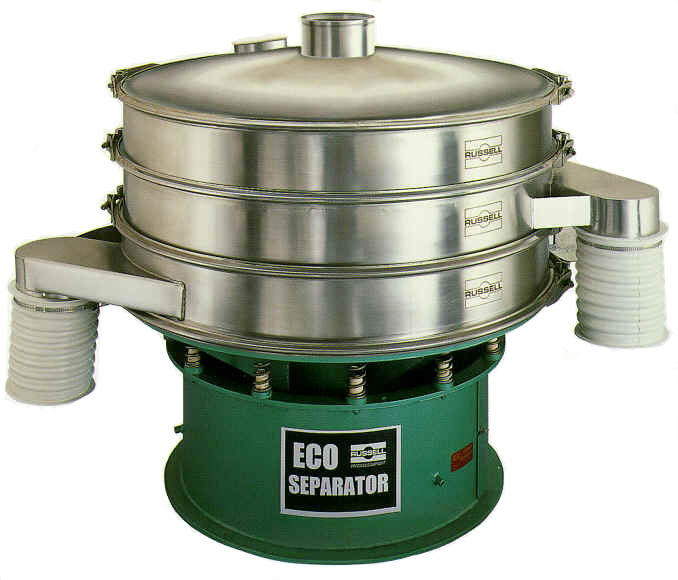 The Russell Eco Separator® is available in six sizes ranging from a 24” to a 72” diameter. The base of the machine is available in a paint or stainless steel finish and can be mounted with up to 4 sieve decks to obtain up to 5 accurate product fractions. At the show the Russell Eco Separator® be demonstrated in full operation. Visit Russell Finex Stand B9 and discover how their separation equipment might hold the answer to your needs. At the stand a team of experienced sales engineers will be at your disposal to help you optimize and enhance your food screening processes. If you would like to know about how Russell Finex have helped other customers in the industry please visit the food case studies or demonstration videos section.